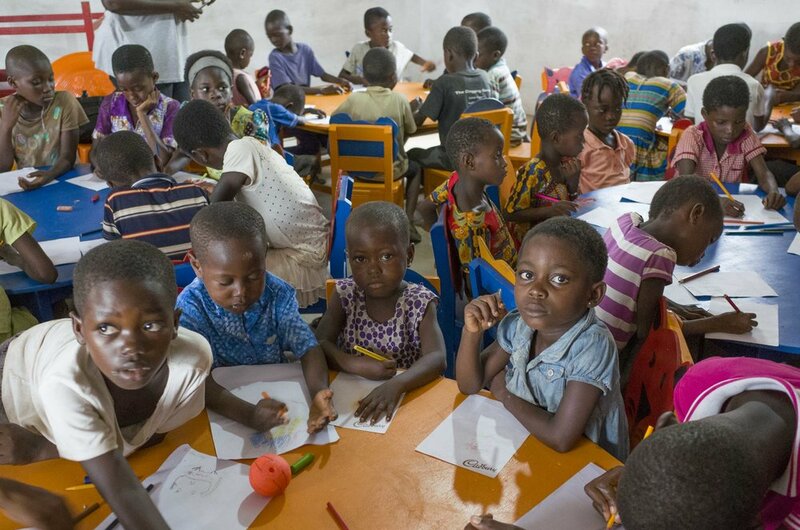 This is a backdated blog from earlier this spring when I went on a trip to Ghana on behalf of the Humanitas Charity to help paint a local school set up and run by the charity. With the images I'd taken whilst there we put on an exhibition to raise further funds for the school project. All the images can be found in the client area of this website. All images are for sale at £35 for a 30 x 40cm print on fibre based paper. Please contact me direct to place your order. I’ve been back less than a week and I’m relishing spending time with my family who I missed so much I can’t describe how much it hurt. I now have a renewed appreciation for my life, the place where I live and the people around me. But as I look over my photos from the village of Ayensuako I can’t help feel that a little piece of my heart is still there. The children came in during their easter break to try out the new classrooms before they were finished. I’d never been to Africa, even though as a young teenager it was high up on my hit list of travel destinations. I remember looking through copies of The National Geographic and Sunday supplements yearning to take my camera and capture my own images of the stunning people and places there. I had aspirations of becoming a photojournalist but I didn’t believe enough in myself to be able to cope with the emotion I could encounter dealing with the starving children, destitute communities and displaced peoples escaping war and famine as I had seen in the media many times growing up in the 80’s. In my 20’s I did however travel to other countries as a tourist, spending time in India, Mexico and South East Asia. I had youth and invincibility on my side. I had no family of my own and no responsibilities. Care free and able to go anywhere without a second thought. But somehow I didn’t manage to get to Africa before my time and money ran out. So 20 years later and just a couple of months ago, when the Humaitas charity offered me the opportunity to be part of a school building project in a rural village in Ghana I jumped at it. I envisaged the images I could capture whilst I was there and thought about the children's lives I could play a small part in improving by giving them the facilities and safe place to be educated for a brighter future. I look at my own children aged 9 and 11 and see how lucky they are to have schooling handed on a plate. As a nation we may moan and protest about government cuts and I do believe we need to keep up the fight for a better future for our children all the time. But really, my kids have everything and above what they need. Bringing up my family in the UK means my kids have access to free education of a very high standard which gives them the opportunity to make choices later in their lives. Not all children have this privilege. Many have very little or no schooling and families struggle to feed their children, sometimes sending them to work at a very young age in dangerous and underpaid conditions believing there is a better chance for them than living in complete poverty at home. These are the challenges facing thousands of families living in rural Ghana. Humanitas charity aims to give these honest, hardworking, desperately poor people the chance of a better life. The kids loved posing for the camera on my journey to the school at the edge of the village of Ayensuako. When I first arrived in the village of Ayensuako in the central region of Ghana I felt overwhelmed. Taken aback by the beautiful people and delightful smiling children all greeting me with open arms and warm welcomes. I was also in shock with the heat and the dust and how simply the people were living. Many in mud clad huts barely bigger than your average garden shed with 5 or 6 children averaging each family. Most of their daily life is lived outdoors under shelter or in doorways sleeping, cooking, working and playing in the sweaty heat. Everyday I’d be amazed at how much weight is carried on even the smallest of heads, balanced expertly, carrying produce for kilometres at a time down dusty and uneven roads. The kids just seemed so much more independent and streetwise than mine here I the UK. I was surprised to see a 9 year old casually peel an orange with a razor blade and a boy only a year older than my own son nimbly climb a 50 ft coconut tree with a 2 ft machete in his back pocket. No ropes, no safety net. He told me his first time up such a tree was just 2 years ago but some boys can start at 8 years old. I was also slightly concerned to see a neighbouring boy playing with a huge and ver rusty rat trap, one boy playfully pushing along an old cycle wheel and others kicking about make shift footballs made from old plastic bags knotted up together. Amongst all the endearing charm and simple customs of the community there were of course parts of the experience that I hope I never have to get accustomed to. The unbearable sweaty heat, the smell of the village dump just by the rivers edge and the flies and other equally annoying bugs that hover waiting for their share of food from my plate and I’m not sure if there were more goats or chickens but they run wild plucking off discarded food remnants and other unwanted leftovers but between them and the lizards that seem to keep the population of mosquitos and other bugs to a minimum. Probably the hardest thing I had to get used to was the noise levels. Vehicles speeding along the road, people shouting so hard at each other I’d wrongly think at any moment blood would be spilled but mostly the local loudspeaker announcements above my head that would starts at anything from about 4.30am before even the first cockerel had a chance to sound his own alarm. The drone of voices were mostly advertisements and preaching but so loud and seemingly aggressive I was glad I couldn’t understand any of the language. This would stop shortly after 9am most days but would start again for the early evening and could go on until after 9pm. One only major relief would be the blessings of another power cut. The electric fans would stop but at least I’d get a bit of peace. One of the classroom walls decorated with the children. The first day I trekked up to the school grounds to commence painting I thought I couldn’t breath and seriously thought to myself how impossible a task this would be. The sweat was dripping off me in buckets. How could I do this physical task without passing out? I thought. I needed to continually douse myself with water and progress was slow. But after a couple of days I climatised and the job got easier. Every now and then I got a whiff of myself but ploughed on all the same. In under a week the second coat was down and the walls were ready to get creative on with some murals. In between painting I’d pull out a book that my own kids had sent with me to give to the school. I’d read to small groups of the kids. Their English is pretty good especially some of the older kids but I soon realised they didn’t really get the story lines, they had no understanding of many objects, places and use of characters in the books so it became a bit of an information overload for them. I decided to write my own story for them that they could relate to more easily. I called it Anna’s Seed. It tells the story of a girl that discovers it is better to learn how to feed yourself than to rely on others for handouts. They really understood the story well even without the images of a picture book. The next day I decided to paint my last mural which would illustrate the story. The kids helped by painting the seedlings that Anna grew. Then on that last afternoon at the school the sky filled with dark clouds and the heavens opened. A torrential thunderstorm fell around us, hammering down on the tin roof of the school. Only one thing to do in a tropical storm, get the drums out and make as much noise as possible. For those that didn’t want to play they just use their incredible ability to fall asleep through anything. An older boy who attends the school gave a hand with the painting. I was sad to leave Ayensuako. This community is strong and has a huge heart full of goodness. I have been greeted and welcomed with warmth and affection from the poorest of widowed mothers to the nobel chief of the area who patiently answered my ignorant questions. I will miss the children of Ayensuako especially Gladys, Ivans and their older siblings living next door to where I stayed. 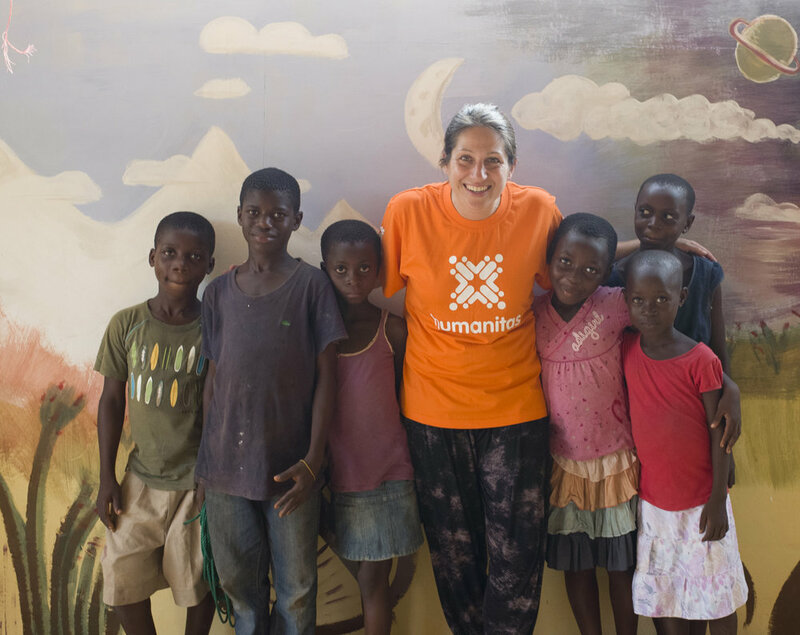 They, along with the other children of the village have made the whole experience a joy, sharing stories with them, teaching them new words and teaching them how to draw cats and paint walls. I was conscious at first not to take photos without asking and didn’t want to act without respect for the privacy of these people but I soon learnt that I couldn’t take a serious photos without 20 kids and grown ups alike jumping into the shot. Photobombed nearly every time. I had to be quick. They enjoyed watching me walk up to the school to paint and walking round the village taking photos shouting out to me ‘abruni’ an endearing term for a white man. I could hear it being called from all corners of the village at me and before arriving to school they would all be there to greet me and pose for the next photo. Now that I’m back in my home town here in Hitchin there’s definitely something missing as I walk down the street. Thank you people of Ayensuako for making me feel part of your community and for reminding me that true happiness starts can with a smile. My last day at the school with Nora outside the new school building. Exhibition Images for sale can be found in the client area.